Darren Archibald is back in the show. After Sam Gagner suffered a sprained ankle in the Canucks’ loss to Florida on Tuesday, a spot opened up on the roster. To take his place, GM Jim Benning is looking to a rare player in his organization that didn’t have an NHL contract. That player is Darren Archibald, who was signed to an NHL contract and recalled by the Canucks on Wednesday. Archibald had previously been on an AHL-only deal. To say that Archibald has had an unusual path to success would be an understatement. 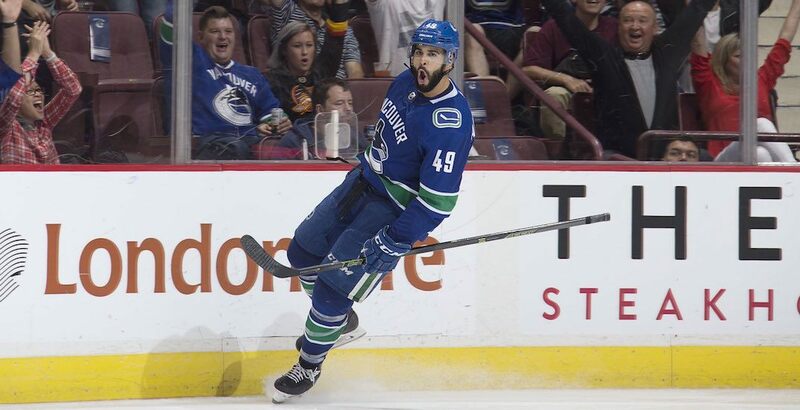 The 6-foot-3, 212-pound winger went undrafted and played two seasons in the ECHL after he graduated from junior hockey, before finally being signed to a free agent contract by the Canucks in 2013. After injuries ravaged Vancouver’s roster the following season, Archibald was called up and appeared in 16 games for John Tortorella in 2013-14. He hasn’t had a sniff in the league since then, spending four full years in Utica with a six-game stint in the ECHL sprinkled in, despite a plethora of injuries to the Canucks the last couple of years. The Canucks have played 313 games since Archibald’s last NHL game, a span of 1428 days. After leading the Comets in scoring last year, Archibald was one of the final cuts by Travis Green in training camp. Now, two days before his 28th birthday, he may be getting his best chance to stick in the NHL. With Derek Dorsett having to retire from hockey earlier this season, the Canucks are looking for some sandpaper in their lineup. Archibald certainly has that, as 435 penalty minutes in 356 career AHL games proves. He can also kill penalties, which has been a sore spot with the Canucks this season.